There’s been a lot of talk recently, about compliance surrounding the use of the words "independent" and "independently owned", in the communication, marketing and websites of financial advice practices. Advisers seem confused. ASIC seem confused. Hefty fines are up for grabs. And one tiny mistake on your website, could be your downfall. Findex were recently penalised for using the term "independent" and breaching the "false and misleading provisions of the Australian Securities and Investments Commission Act 2001 (ASIC Act)". ASIC themselves, are currently seeking legal advice to obtain clarification on using the phrase, "independently owned" (vs independent), as outlined in Section 923a of the Corporations Act. And hopefully, there's someone on your team checking that your marketing materials are compliant when they're created, and continue to stay so. Because when there are tools that make it really easy to make changes to your website and create your own new marketing collateral, it can be pretty easy for things to slip through the compliance cracks. One thing that may be missing from your compliance checklist, is some of the back-end elements of your website. Back-end? Consumers can't see those bits, right? There are a few key back-end parts of your website, that can appear on the front-end, and in Google or Bing search results. Don't worry. They're easy to check and easy to fix. Every website has page titles and page descriptions. They contain small but important bits of information, called "metadata". A page title is the text that appears in the tab of your browser, or when you save a page as a bookmark. 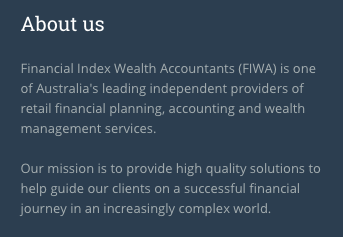 The page title for the AIOFP says "independent financial advice". Uh oh. It's also what often appears as the clickable heading in Google search results. Although keep in mind, the wording of the title may change depending on the search terms you enter. Google tries to help you find what you're looking for, so they will adjust, based on the words in your search. The Google search result, using search terms “independent financial adviser” (without the quotes). 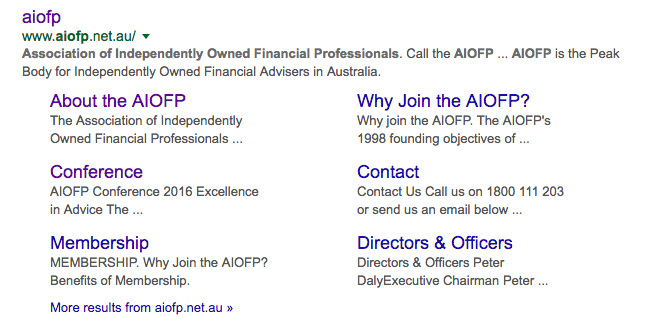 The Google search result, using search term “aiofp” (without the quotes). The page description plays a similar role and is similarly influenced by the search terms. So is it Google's fault for saying you're independent, even if you're not? Because you can define both the page title and page description in the back-end of your website, and it's quick and easy to do. On modern websites, page titles and page descriptions can be set for every page and post (and image...but let's keep it simple). By default, many website platforms will just use the heading of your page as the page title, and the first portion of text on the page as the description, unless you manually change it. The good news is, it’s easy to check and change…albeit a bit tedious and boring if you have a large site. You'll need to swap out "yoursitename.com.au" for your own domain name, and replace "independent" with the search term you're looking for. You might need to do a few searches for any terms or phrases you've identified as being potentially problematic. This will find most of the instances of each term or phrase on that specific site, but keep in mind it will only search pages which are indexed by Google. This can be a useful tactic for Compliance Managers checking advisers' websites. Note: If you've got access to your website backend, it's probably easier to just check each page from there, and jump straight to step 5. 2. 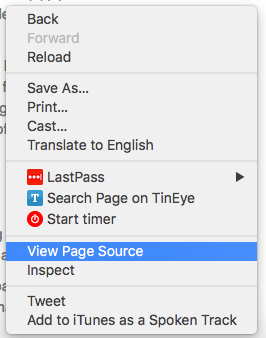 Right click anywhere on the page, and choose “View Page Source”. If you don’t see that option available, click elsewhere on the page, like in the margins, and try again. Right click on your site and select “View Page Source”. 3. A new tab will open, and you’ll see a page full of code. Take a deep breath…you’ve got this. 4. You'll want to try to find the "naughty" words or phrases. To save your eyes (and sanity), hit CTRL F on your keyboard (or CMD F on a Mac) and enter each phrase that's on your black list. You'll see those words highlighted in the code. To look specifically at the page title and page description (those sneaky hidden bits), look for the words "title" and "description". Note: You might also see things like og:title and og:description. "og" stands for open graph. It's the metadata that a number of social media platforms, including Facebook, use to pull through titles and descriptions when links to your website are shared. So don't ignore those bits either. 5. Once you've gone through each page and post on your website, ask your trusty web developer or in-house website guru to help you fix them. If your website's built using WordPress you might be using a plugin called “Yoast”, which is where you’ll make the changes. The Yoast plugin snippet editor on the Sixpence Media home page (back in my site's WordPress days), where you can define page titles and descriptions. I don’t optimise for SEO. I optimise for humans — specifically, my ideal clients. SEO is secondary. 6. Finally, if you've had to make any changes, it's a good idea to ask your web developer to login to Google Search Console and Bing Webmaster Tools to resubmit your sitemap. That action will prompt Google and Bing to reindex your site (i.e. update what information and pages appear in the search results). If you don’t do this, Google and Bing will eventually crawl your site and reindex it, but it will probably take a little longer. Manually changing your page titles and descriptions isn't a bad thing — in fact, quite the opposite. But when working with your outsourced or in-house marketing and web teams, be observant, ask questions, and pay attention to all the little details. And don't be an idiot and try to game the system. * I'm not a compliance expert. This is my opinion. From where I sit, if you can easily control something that could be perceived as "misleading", why wouldn't you?